A major recycler of aluminum for the automotive industry had outdated equipment that ran too slowly and broke too often. Enter MMCI. 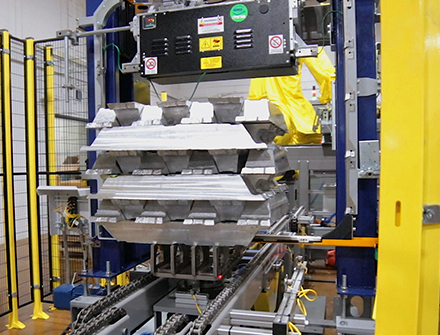 Develop a rugged end-of-line packaging solution that could align aluminum ingots, stack them, weigh them and then bind them for transport and storage. Plus, the system would need to operate at a much faster speed than the current system and withstand the high temperature environment. After evaluating the entire process, MMCI engineers determined that they could design a robotic unitizing cell featuring a FANUC M410iC robotic arm along with innovative upstream and downstream solutions. The ingots enter the cell on a rugged chain conveyor with a smooth, consistent surface, accumulating at the end of the line. An inline system would then center, flip and align the ingots on the fly - significantly increasing the system’s capacity. Next, high tech laser sensors detect the reflective nature of the aluminum ingots and accurately communicate their position to the robot. The robot’s end-of-arm-tooling is configured with 3 independently actuated grippers and custom channels that ensure the proper transfer and stacking of each ingot. An inline scale calculates the exact weight of the unitized load on its way to the strapper. 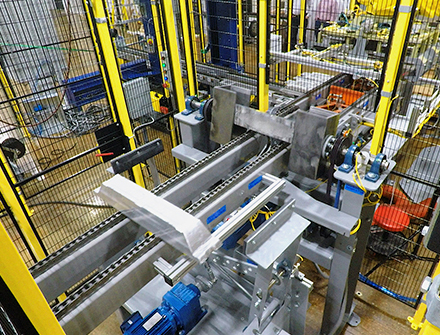 MMCI completely automated the strapping process with a lift, turntable and multiple sensors that ensure all straps are properly positioned to align with notches on the ingots. Finally, to accommodate the hot, industrial environment the robot was outfitted with a protective suit and monitored with inline temperature probes through a climate-controlled cabinet certified to 120 degrees Fahrenheit. 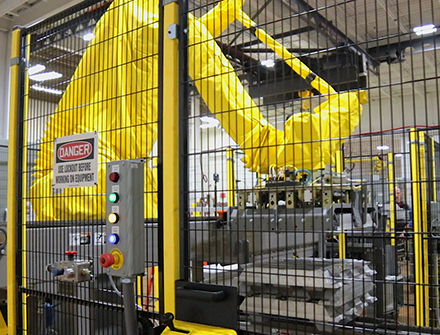 With the new automation, loads are being unitized fast enough to keep up with production while the rugged design and protective features have virtually eliminated downtime. 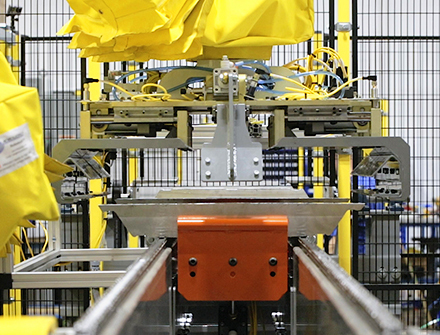 Plus, the inline weighing and strapping processes have helped improve efficiency and reduce costs. This project represents another example of how intelligent engineering and a focus on automating an entire process yields game-changing results for our clients.